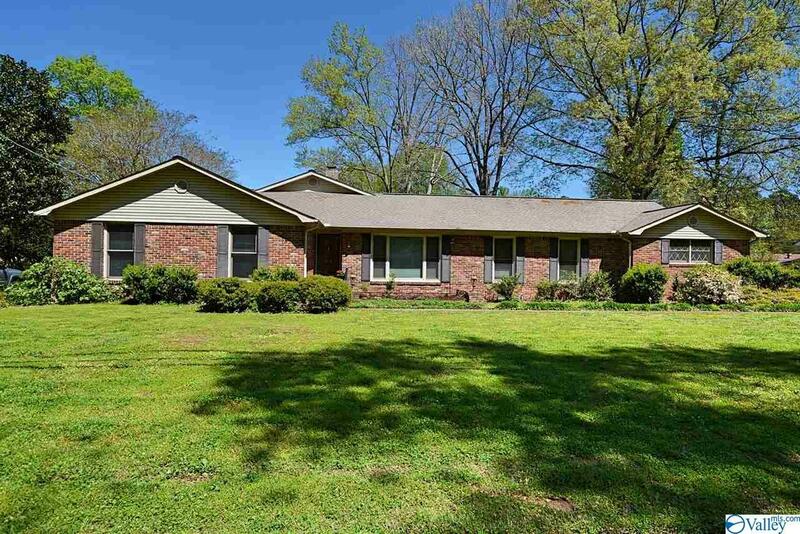 Classic Full Brick Rancher in one of SE Huntsville's most popular Neighborhoods. Stroll 1/2 block to the Greenway which leads to Jones Park, Movie Theater & Target Shopping area. Nearby New SE HSV Library/Community Center completed soon. Functional Floorplan has Hardwood Floors t'out all Living Areas. Kitchen w/ Corian Counters, Formal Living & Dining Rm off Foyer, Family Rm w/ Fireplace & Vaulted Ceiling + Wonderful Bonus Room w/ Built-in Banquette +lots of storage. 4 BRs/2 Tile Baths. Master Bedroom has Hardwoods, large Walk-in Closet & Private Sitting Room w/ views of Backyard. 2 Car Side Entry Garage PLUS detached 2 story 2 Car garage. PRIME LOCATION!! !